Do you find yourself constantly hitting that dictation key on your iPhone 4S despite the fact that you never use the feature? Do you just wish you could disable that key without getting rid of Siri too? If that’s the case, NoDictation is the Cydia tweak for you. One of the cool features of NoDictation is that it’s completely open source. If you want to see how NoDictation works or to integrate the tweak into a project of your own, you can visit NoDictation’s Github page. It’s also good from a security perspective if you want to know exactly what you’re putting onto your phone. 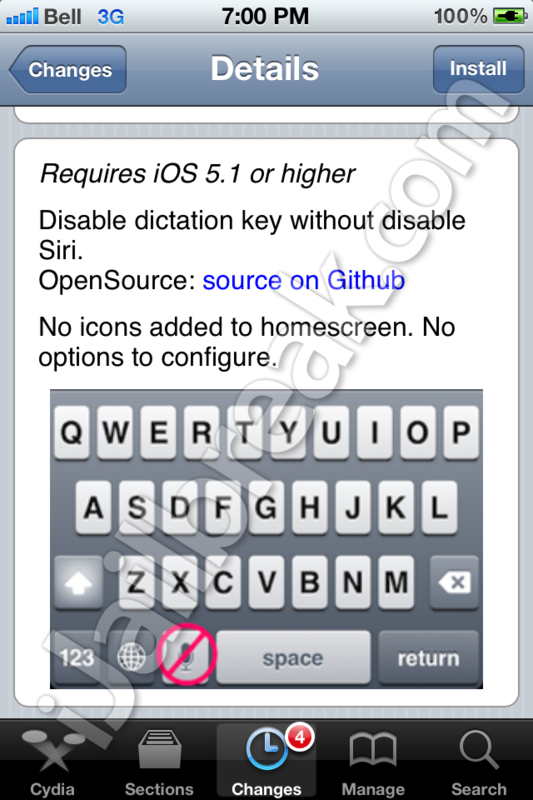 NoDictation is available in the BigBoss repository on Cydia for free. NoDictation requires iOS 5.1 and will install the dependency gsc.dictation. NoDictation does not add an icon on to the SpringBoard or require any options to be configured. You can disable NoDictation by uninstalling the tweak from Cydia. There’s no indication as to whether this supports the new iPad in addition to the iPhone 4S. Do you find the iPhone 4S’ dictation feature helpful or annoying? Share your thoughts in the comments section below.